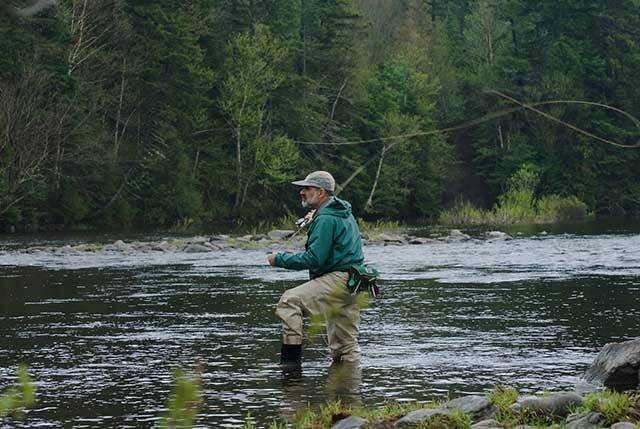 The fishing in western Maine can be quite good in August, if you can find where the trout are hiding. This requires time and patience. By keeping your ears open and mouth shut, you might catch some gossip while waiting on line at the general store, hear a bit of loose talk between locals while pumping gas, or a sport boasting over dinner at the sporting lodge. Of course, nothing beats putting time in on the water, which is what I’m doing on this particular afternoon during the last week of the month. With sleeves rolled to the elbows, my lightweight shirt damp with perspiration, I steer the Grumman, our sixteen-foot, aluminum canoe, along the eastern edge of the lake. Turning toward an island, I cut back on the four-horse-power outboard fastened to the craft’s square stern while checking out a nest built high up in a spruce tree. Earlier this season a state biologist had banded two eagle chicks. Although there is no movement in the massive labyrinth of branches, a few yards away, in another spruce, a mature eagle, its white head offset against a dark blue sky, glares down at me from a cold, yellow eye. Crossing over to the western side of the lake, I motor northward. Evergreens spread down from each bank. The smell of balsam is strong. A moose grazing along the shoreline raises her head while I watch thunderheads build over the hills that rise in the distance. As the lake gradually narrows, marsh grass that remained submerged during most of the spring has formed a wide plateau extending outward from along the western shoreline. In August, the forest palette is comprised of varying shades of green, the marsh grass lighter, more vibrant than the hills with their dark green conifers and lighter green hardwoods. A loon dives a few yards off my bow. Not far away the bird’s mate follows. The same biologist who tags the eagles also monitors the lake’s loon population. He once explained that few loon eggs survive predation, the hatchlings that do, breaking free of their purplish-gray eggshells each year around the first week of July. I follow the lake around a rocky peninsula that was once dammed to raise the water level as part of extensive log drives, which in years gone by used the waterways to float timber from smaller streams to lakes and from the lakes down wider rivers to still larger lakes until reaching the paper mills built along the banks of the Androscoggin River across the border in New Hampshire. The water here is shallow, vegetation just under the surface prone to strangle an outboard’s propeller, causing an engine to overheat. Not far beyond are a series of submerged boulders. Although of no concern in the spring, this time of year I must be careful to navigate around both obstacles. A cormorant stands atop one of the boulders, the bird’s wings extending outward like a pudgy vampire about to take flight. As the clouds draw closer, the surface of the lake grows still. After motoring around the outstretched arm of land, I enter a large cove that remains shallow forcing me to proceed with caution. The conifer forest drops down along the eastern shoreline while great expanses of marsh grass continue to advance from the west. After reaching the far side of the cove, I cut the engine and drift into a narrow channel formed between the marsh and a small island. I can see that the gut is deeper than the water in the cove. The sun slips in and out of the clouds that now hang over the marsh and threaten to sweep over the lake. I hear a little stream that enters the other side of the narrow channel. Slipping out of the forest, its current forms a set of shallow riffles that glide over a bed of cobble and into the deep trough through which I’d pass. After dragging the boat onto a shoal, I gather my gear. An osprey rides a thermal current over the cove while snipes spiral upward then dive toward the marsh plateau. The air whistling through their wings makes an eerie sound. In the distance a logging truck rumbles over the wooden bridge that traverses the stream. Although unable to see the vehicle, I can hear it wind along the eastern shoreline, the sound of the rig fading into the forest. After connecting the two pieces of my cane rod, I knot a Gold-ribbed Hare’s Ear to the end of the line and wade back toward the channel. The stream’s cobble gives way to the lake bottom, a mixture of grit, mud and sand pluming upward as I shuffle into deeper water. I cast toward the edge of the channel, where the river’s colder, clearer current mingles with the warmer, tannin-stained water of the cove. A meager breeze sweeps out of the southwest momentarily ruffling the lake’s surface. Along the sod bank, strands of grass sway as if in anticipation of the coming storm. The Hare’s Ear sinks a few inches, a brook trout striking as soon as I impart movement to the wet fly. The little fish takes my breath away, its scarlet fins etched in white and black, its belly golden. Sprinkled along the flanks are red-in-blue dots that combine with yellow spots, the gills the shade of blood. All in stark contrast to the somber beauty of the vast forest surrounding this dark water that reminds me of a moody lover. The clouds that rolled in over the lake block the sun. The trout at the entrance of the gut remain small, no more than six or seven inches long, but when I extend my cast a nine-inch fish, and then one that measures ten inches strike the fly. I stare out over the great expanse of wavering grass, can almost feel the gray clouds pressing down, the air heavy, the scent of balsam mingling with that of the lake, the grass, and the grit and mud kicked up by my wading boots. The distant hills are lost under a shroud of falling rain that has yet to descend upon the water. I untie my neckerchief, submerge it under the surface, and after removing my cap, wring out the water over my head, wiping the damp cloth across my face before tying it back around my neck. After releasing a trout longer than the last, I cast my fly in search of a larger fish, a brook trout measured in pounds rather than inches, perhaps a refugee from a time when Herb Welch and Wallace Stevens worked this water. Although few in number, these piscine apparitions haunt my dreams. When the strike comes it takes me by surprise, the trout running, my hand trembling when the rod arcs. Then, with the reel screaming, the line goes suddenly limp. I look up at the gray shroud. The cove is silent, the air still. I want to shout or perhaps cry. Instead, I reel in and after checking the fly, cast once more into the dark water of the deep trough, but the moment has passed, the ghost fish gone. After another ten minutes I slog back to the boat, the first raindrops falling upon my shoulders. Beyond the narrow channel, across the vast expanse of the cove, each drop is like the rise of a trout, as many trout as stars in a midnight sky.